Have you ever seen commercials where one competitor claims, “Our product is favored 2 to 1 over that of our competitor”? If you’ve seen commercials like this, chances are you may not have believed the results of the study. However, someone in your family or an unknown individual across the world took everything on the commercial as though it were true. Studies and research can be helpful but sometimes misconstrued for hidden or secret purposes not made available to average consumers. NBC’s Meet the Press conducted a smartphone survey recently to see which smartphone is the clear favorite among congressional House members. The results of the two-week study show that, of the 88 congressional House members that participated in the study, 58% prefer the iPhone as their smartphone of choice. 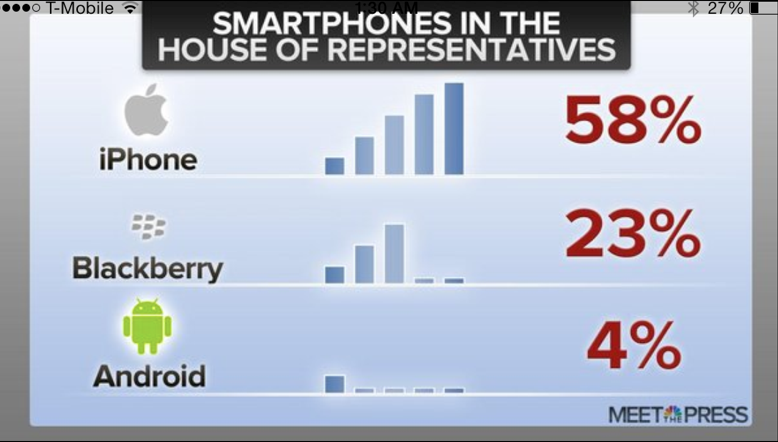 Surprisingly, 23% of congressional House members still prefer and/or use Blackberry. 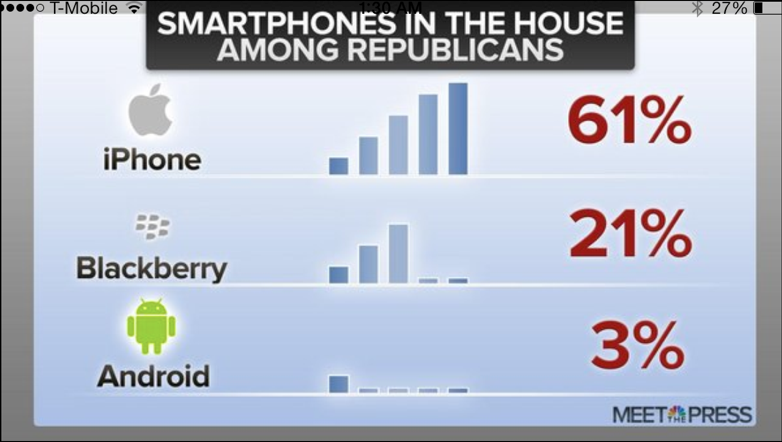 As for Android, only 4% of the 88 House members surveyed own an Android smartphone. This is an adequate survey from NBC, but it has been used yesterday as bait for the iPhone and iOS – and a number of Apple sites (I will not name them to give them credibility for doing this) have reported on this article. You may ask, then, why would I report on this news here? I do so to point out a common fallacy that even the tech media has bought into: that is, the so-called Appeal to Authority fallacy. I remember watching commercials that drilled home this same idea in the 1990s. Certain people smoked a certain type of cigarette, or drove a certain vehicle. The point of the commercial was to make me (and others) believe that the vehicle is the best on the market because a Hollywood celebrity drives it. What the commercial didn’t show me then was that, although the celebrity in question promoted a BMW, he might have left the commercial set and driven a Jaguar all the way home. In other words, his or her endorsement of a certain brand name vehicle meant nothing when it came to his or her own personal vehicle preference. Popularity is not the same as quality, or what matters to each individual. With the congressional House study, I think the same thing is being implied by a number of Apple fan sites: so many congressmen use the iPhone, therefore, you should too. They would never come right out and say this, but it is implied. If this were not the motivation, why would they spend time reporting on a study that, for all intents and purposes, would have been published across the Web, virtually unnoticed otherwise? What Should You Do With the iPhone Study? The appeal to authority fallacy wants you to “get onboard,” so to speak. If so many numbers of congressional House members use the iPhone, “there must be something to it,” many would say. And someone, somewhere, will take this study and use it at an Android site to say that the iPhone is better (if you’re the guilty party, I don’t wanna know). What should you do with this study? First, take it at face value. So many congressional House members prefer the iPhone. That is simple; no matter how many Android users love Android, the fact is that congress does not (apparently). At the same time, however, do not take this survey at face value to such an extent that you miss the factors behind why the study turned out the way it did. There were 12 congressional House members that did not participate. What were their reasons? We are never told. Even if they did participate, the results would not have shown much difference from the 88 members that did participate. Next, understand that there are a number of factors that influenced the outcome. Economic factors are one possible explanation. Some individuals purchase high-end smartphones because 1) they can afford them and 2) everyone they know is buying them. When it comes to Congress, a number of individuals can afford high-end smartphones and buy them. 61% of Republicans favor the iPhone versus 56% of Democrats, and most congressional members have better economic conditions than most working-class Americans. Could economics play a role here? Perhaps. At the same time, we have to consider that there is a large percentage of congressional House members (23%) that still believe in Blackberry – even though the company may soon be consumed by investment firm FairFax Capital. These House members are considered to be against the mainstream smartphone market and feel no shame about their preference. Finally, it could be a case of nothing more than consumer preference. Android smartphones are still worthwhile (I say this as an iPhone 4S, iPhone 5, GS3, and GS4 Active user), but can be too complex for some individuals. The iPhone offers a basic experience where users need only download the apps they want (with only a few pre-installed), and many find this comfortable to live with. At the end of the day, some people prefer one brand over another. 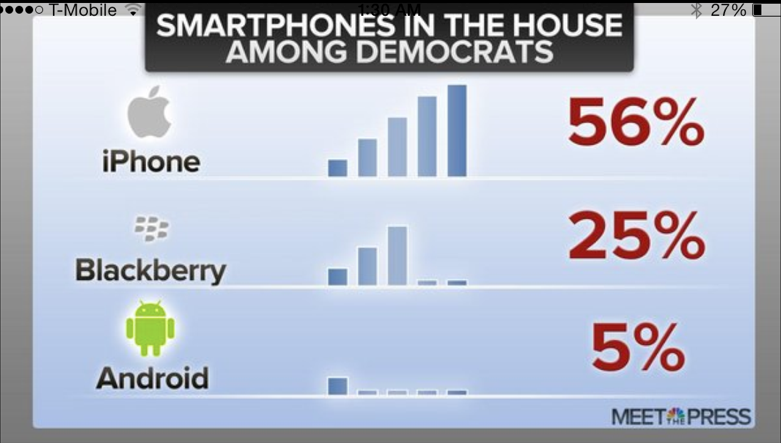 If the NBC study had said that more congressional House members prefer Android over the iPhone and Blackberry, I would say the same thing. Humans are complex, and one factor alone cannot tell the whole story. At the same time, you should not let an NBC study determine whether or not to get an iPhone. NBC doesn’t have to live with the consequences if you don’t like your choice.